Adobe Analytics makes it very easy for anyone to quickly get in and get the information that they are looking for and pull a report if necessary. Adobe Analytics allows us to tag thousands of events that we want to track and then see the data that is tracked based on these events. The set up is lengthy, but incredibly worth it once completed. The audience segmentation tools in Adobe Analytics are great. We are able to get an incredibly detailed view of our customers and how they interact with our brand across our many channels. Creating and editing emails and landing pages content. Their new editor is a lot easier to use and simpler than a lot of other editors I've used. Managing contacts and smart lists. We're able to quickly find and segment contacts as well as change the info. HubSpot integrates with Salesforce really well. There's little to no lag time. Onboarding is a breeze. They take you through every step in the process and give hold your hand during the entire process. I mentioned customer support before as being a 'pro' because it exists, but it is also an area where Adobe Analytics could improve. Support is often slow to respond to inquiries. Adobe Analytics can become very expensive, though this is dependent on your usage. Adobe Analytics is not for beginners. It has a steep learning curve, so if you are a beginner, make sure to get the most out of your money and understand how to use the platform. When someone subscribes to the company blog, they can choose a frequency of how often they'd receive an email but I'd like to see a blog subscription option for blog subjects as well. Creating workflows can get tricky and confusing. I've been using HubSpot for six years and I know it's the best solution for SMBs pursuing inbound and content marketing. As long as I'm working with, or I am, an small or medium-sized business and have sufficient content to share with target prospects, I'm confident that HubSpot will remain the right solution for me and those firms with whom I am working. Hubspot's tools typically walk you through everything step by step so you don't get lost or confused and offers a lot of help topics to help you. Not very many companies get this one right, but I will say that although I may not like their standard technical support, they do make it very available and with the help of a good account representative service issues can be handled well. I did the 2-day classroom at HubSpot's corporate office in Cambridge. First off, it was amazing to see their corporate office in general. They have such a cool office environment. But it was also great to have the ability to learn in a workshop format with other HubSpot users and meet my Account Manager/ Inbound Marketing Consultant in person. I went through Inbound Marketing University in 2006. Great training and helped my transition from traditional (outbound) marketing to inbound marketing that I've been able to apply to a number of businesses from wastewater and water reuse, to professional services and SaaS. Share information of value to build awareness and trust. Answer customers' questions in a transparent way to generate more qualified leads. Understand the difference between a marketing qualified lead and a sales qualified lead and put together a lead nurturing program. Your sales and marketing efforts will see significant ROI. If you are coming from a system such as WordPress, HubSpot can seem overly constraining. Realize that HubSpot is designed to put the power of a website into a non-programmer's hands. Your marketing people should be able to do pretty much everything, without resorting the technical staff. I had just started with the company and they were using Eloqua. We researched Hubspot and found that it was going to cost us less, be easier to use and give us a lot more functionality than what we were paying for Eloqua. 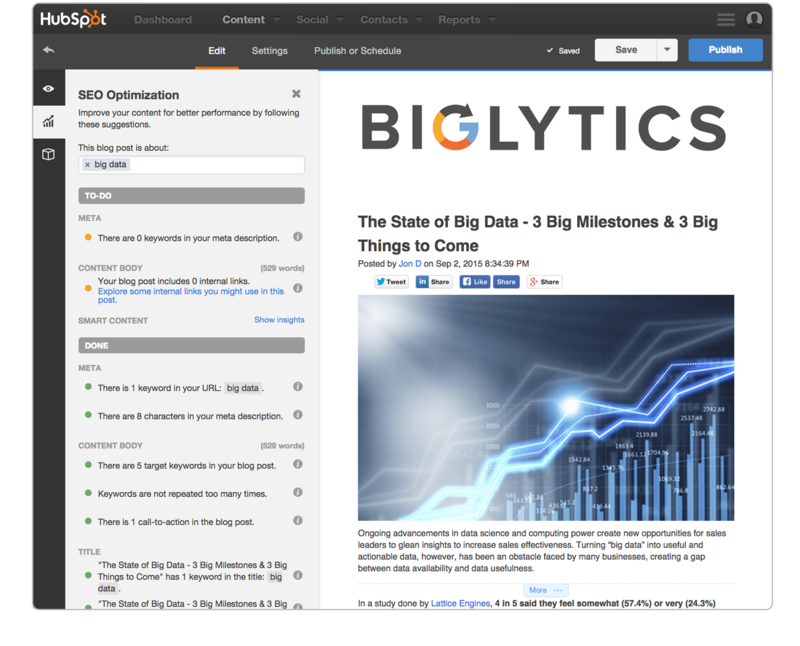 Hubspot is perfect for our database size where Eloqua is set for larger companies. While HubSpot initially, seven years ago, seemed built for SMBs it appears they have scaled their solution for larger enterprises. I do not have experience sending out 10 million-plus emails per month so I don't know how HubSpot would handle that. However, I do know that some other marketing automation platforms have had trouble with such scale. As such, I suggest HubSpot have one of it's enterprise customers share data on the length of time it takes to send out 1 million emails. Are we talking minutes, hours or days? Then decide what's right for you based on your business needs. We were able to identify that the number one reason that users visited our site for wasn't being properly taken care of and we were able to increase significantly the usage our our internet banking after improving this experience. We could identify that customers were getting lost after being prompted to log in to complete a transaction from our marketing pages and were able to fix that, increasing online sales for our most profitable products. Hubspot has given us better reporting metrics on items we reported on before. I can see contact activity in their profiles. It allows me to manage the blog quickly and efficiently with lots of flexibility for design and posting options within itself and the social media. HubSpot Blogging and SEO - HubSpot provides an integrated set of tools for Search Engine Optimization (SEO) which makes getting found online a natural part of your inbound marketing mix. More than a simple CMS, HubSpot provides an integrated authoring view with SEO-oriented suggestions as you write blog posts.